Most tents are designed with a primary focus of shelter. They help block out the sun, keep rain out and can be heated or cooled. Then there is the Sailcloth Tent. Traditional vinyl tent tops, which are made with white vinyl and have a blackout material in the middle of the fabric to "blockout" the sun and not allow light to pass inside or outside. Sailcloth tents on the other hand are made from a lighter (10 oz vs. 16oz) translucent sail cloth fabric. These tent tops do not have the blackout material in the middle of the fabric, which allows for some amazing light displays for your wedding or special event. 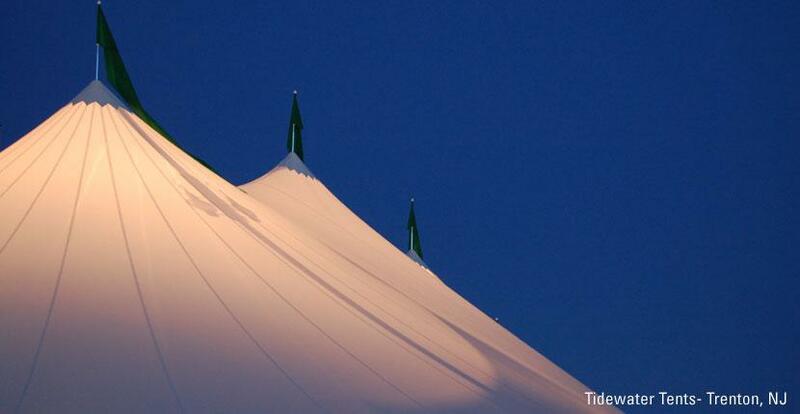 Sailcloth tents are designed to have a hint of nautical flare with sculpted peaks and eaves, which create beautiful well lit space like nothing you have experienced before. During the day the translucent sailcloth tent fabric has a warm, natural light and then at night you the tent dramatically glows for evening weddings and events. Sailcloth tent rentals are especially popular on the Gulf Coast from Mobile, Al to Destin, Fl and have transformed backyards from Pensacola, Fl to Montgomery, Al. The inside of the tent has graceful lines from the sailcloth fabric, which is both waterproof and strong to protect your event from the elements. We also have specialty flooring, lighting and custom decor so that all the elements of your event come together. When you're ready for your next tent rental in Mobile, Al, call SOHO Events and Rentals and ask for our sailcloth tent. We are based in Fairhope, Al, serving everywhere - with an emphasis on Mississippi, Alabama, and Florida. Anchor - Is the method used to secure a tent, canopy, or structure to the ground. Some examples include stakes, concrete dead weight, or water barrels. Area - This is the covered surface under the perimeter of the tent - plan on additional space around the tent for anchors and guy lines. Cross Cable Tent: Aluminum or steel perimeter that uses steel cables to support a center pole. Also known as a frame and cable tent. Frame Tent: Freestanding framework supports the tent fabric, therefore there are no center poles. Pole Tent: These tent fabrics are supported by center poles and side poles. They also require stakes and/or anchors around the perimeter to tension. Sailcloth tents, single pole tents and double pole tents are all examples of pole tents. Pop Up Tent: Accordion style internal framework supporting the fabric. Structure - Channeled beams with sliding fabric (also know as keder tents). Truss Arch - Rigid internal arch - shaped truss framework that supports the shelter fabric. Eave - The perimeter of the tent, on a frame tent this is where the valence meets the tent fabric roof. Eave Height - This is the vertical height of the perimeter of the tent and determines the clearance available for people or equipment to pass under. Expandable Tent - The ability of a tent or shelter system to be lengthened or shortened by adding or removing fabric sections and hardware components. Expandable tent or shelter systems can be built to any desirable length. Fabric sections are joined together using methods such as grommet & lace lines or Keder track. Frame Tent - A tent with an assembled framework made of aluminum or steel tubing that supports the fabric roof and defines the shape of the structure. Guy Line - Rope or ratchet buckle assembly that is attached to the fabric or frame system on one end and attached to a ground anchor system on the opposite end. Guy lines and anchors are set out from the perimeter of the tent, canopy, structure, or shelter, adding to the footprint. Marquee Tent - A long and narrow tent without sides used for sheltering walkways or defining an entry to a tent, building, or house. Occupancy / Seating Capacity - The number of people who can occupy or be seated in or under a tent, canopy, structure, or shelter. The seating capacity will vary by seating arrangement, such as buffet dinner, sit down dinner, or cathedral / row seating. Click Here to view Occupancy / Seating Capacity Chart. Overall Height - The overall height is the distance between the base and the highest exterior point of a fully installed tent. For pole tents, the pole pin is included in the Overall Height measurement. Pole Tent / Push Pole Tent - A tent with a set of individual poles arranged beneath the fabric roof to support and define the shape of the structure. The fabric roof is tensioned over the poles and attached to ropes and/or webbing at designated locations around the fabric's edge. The ropes and/or webbing are tensioned to the ground using stakes, anchors, or augers around the perimeter of the tent. Sidewall - A removable sheet of fabric material designed to hang from the eave around the perimeter of the tent, used to block the interior of the tent from the outdoor elements. Sidewalls are available in various types and may not be interchangeable between tent classes. Also known as a tent wall or side curtain, sidewalls can be connected together with side release buckles, zippers, or hook & loop to fully enclose the tent. Tent - A temporary structure composed of a covering made of a pliable membrane or fabric and supported by mechanical means such as poles, metal frames, beams, columns, arches, ropes and/or cables. Tents are also commonly referred to as a marquee, canopy, or pavilion.